Marrakesh is so different from every other city I’ve ever been to. It is a magical & colorful city and there is plenty to see and explore. From the moment, we arrived in Marrakesh I fell head over heels for this place. I guess the sun and the temperature had something to do with that too… From the rainy, cold Belgium, to the hot & sunny Morocco, YAY! You cannot go to Marrakesh and miss the Djemaa El Fna square. Go there when the sun sets, because then it becomes magical. Storytellers, musicians, snake charmers, henna artists, souvenirs sellers and not to forget, delicious food stalls… it is all here. Colorful markets where you can find anything you need. These streets are chaos but the vibe here is amazing. 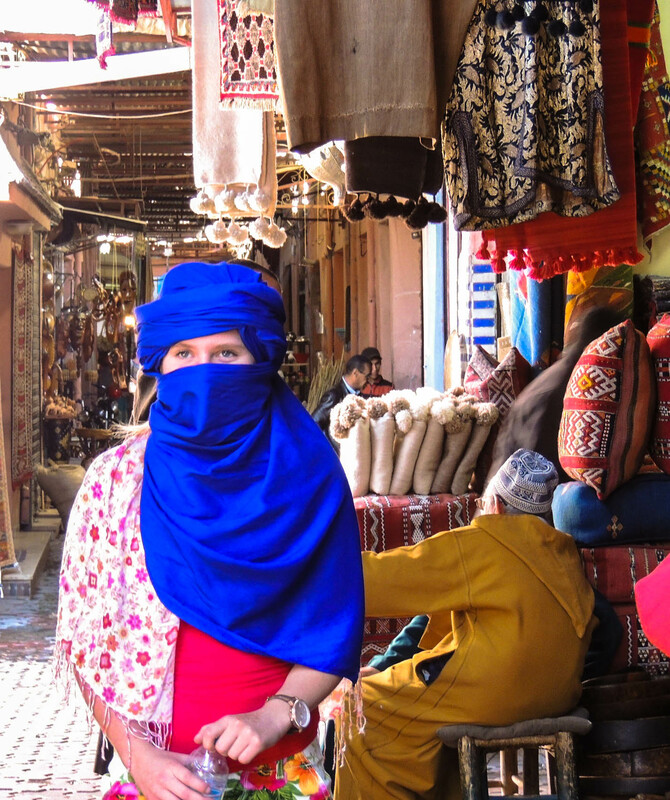 Look around, stroll through the small alleys and absorb the real Marrakesh. Ben Youssef is one of the oldest Koran schools in Morocco, but at this moment it is empty. You can still see the small rooms where students stayed. It is just so pretty with all the mosaics. We aren’t really museum-people but this is one you need to see, because it is in a palace of the 19th century, where you can admire the small colorful tiles, wooden ceilings and the hamam. Café Arabe is a beautiful restaurant/bar with different floors and the interior is so pretty and magical. If the sun shines you can enjoy the rooftop terrace with big lounge chairs and a stunning view of the souks. If you go outside the old town, you can visit the beauty of the building Theatre Royal. It was only build in 2001 but architecturally, this is a pearl! At the end of the 16th century the palace El Badi was build by Sultan Ahmed El Mansour. The palace has once 360 rooms, a huge swimming pool and a lot of underground cells. At this moment you can still see the ruins of this palace. One of the oldest city gates (build in the 12th century) of Marrakesh is Bab Agnaou, which means the gate of the black people. It gave access to the royal kasbah, where palace El Badi and the Seedic grafts. An hour away from Marrakesh there is the Ourika Valley, which is a popular place during the summer because it is a bit cooler here. You can raft here of hike to the seven waterfalls of Setti Fatma (we did that). During the trip to the valley we also stopped at a local market, where we mingled between the locals. We also visited an argan oil factory along the way. And the view along the way are so beautiful! I’ve never slept in a more magical place than this one. With all the beautiful mosaics, the colors, the vibe,… it was so pretty! We loved staying there and the rooms were clean, big and stunning. Breakfast was served on the rooftop terrace, which was a great place to start the day! So this was it… I’m so sad that Gilles has not experienced this trip with me. We just met back at that time. Now I’ve seen a glimpse of the beauty of the Morocco, I definitely want to go back there in the future, because there is so much more to see. Hope you enjoyed reading about my fantastic trip in Marrakesh. If you have any questions, please let us know, maybe we can help you!